AccuSearch provides fingerprinting services for individuals whose jobs or entry into organizations require fingerprint checks. Our fingerprinting specialists are familiar with the quality requirements of the Arizona Department of Public Safety (DPS) and the Federal Bureau of Investigation (FBI), so that it’s unlikely that the fingerprint card will be rejected by either law enforcement organization. In the rare event that the prints are rejected, AccuSearch will provide replacement prints at no charge. Please be sure to begin applying moisturizer to your hands at least 1 day in advance of having your prints processed as dry skin makes it difficult to obtain high-quality prints. 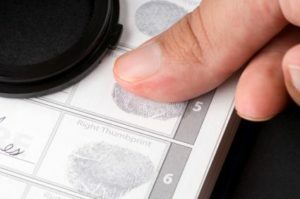 AccuSearch also provides on-site fingerprinting services for Maricopa County-based organizations scheduled in advance for the convenience of those who are to be printed at a discounted per person rate dependent upon the volume to be processed. There is a per diem site fee of $50.00 - $100.00 dependent upon location.